Today is Vishu, Kerala new year. My vishu kani this year was arranged by mother nature herself - a beautiful new day. I look forward to a bright new year of happiness and health. And I wish you all the same. 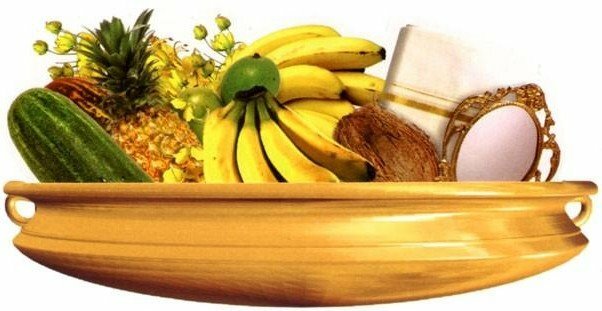 Vishu Kani - a person’s fortune for the year is believed to be dependant on the object he/she first sees on Vishu day. Kani is an arrangement of objects that promise prosperity, kept for people to see when they begin their new year. Ganesh, Thank you and wish you a happy new year too. I will catch up with you sometime during the weekend. Happy Vishu to you.Awesome,Totally love your flair for poetry in Hindi. thank u and wish you too. Thanks for your comments, you are most welcome :) Likewise, I enjoy reading your posts. You always bring along those precious gems from gulzar and other great poets. @Edu, Glad you came by and hope to see you around :) Thank you for your kind feedback. @Jo, Well, vishu without family - I was not hoping for much anyways :). But had a good day. Hope you had a great time. You write great poetry! Will visit ur blog often now :). And a very happy Vishu to you.